One day after her 96th birthday, Anne Jenkins Arnoult died, after a three-year struggle with Alzheimer’s. Greatly beloved, Anne died well, surrounded by her family and caregivers. 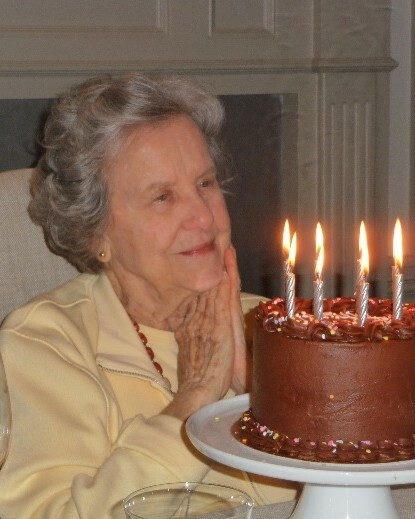 We thank God for blessing all of us through Anne Arnoult (Mimi). Anne was born at home in Midland, NC, on Thursday, March 15, 1923, between World War I and the Great Depression. She was the second of eight children born to farmers John and Zelma Jenkins. During WW II, Anne aided in the war effort working as a secretary in Charlotte, NC, in a Navy artillery shell plant. She had a blind date with a handsome bomber pilot named Buddy Arnoult. Romance ensued and they were married. After the war, Anne and Buddy moved to Jackson, MS, where they set up household and had two sons, Jeff and Tim. Anne dedicated her life to Buddy and the boys. In 1960, the Arnoult family relocated to Beaumont, TX, where they lived for many happy years. Late in life, Buddy developed Alzheimer’s and Anne lovingly cared for him at home till the end. In 2007, she moved to Houston, into The Hallmark, to be closer to her two sons and their families. She developed Alzheimer’s herself and ultimately succumbed to it. Anne’s faith in God sustained her throughout her life. We will miss her, but rejoice that she is now well again and in the presence of our Lord. Anne Jenkins Arnoult is survived by her sister Patricia Jenkins Lookabill; her son Tim Arnoult and wife Frances Nelson Arnoult; her son Dr. Jeff Arnoult and wife Susan Belew Arnoult; her grandchildren Annie Edmonston Arnoult; Dr. Lindsay Arnoult Fox and husband Dr. Will Fox; Tim Arnoult Jr. and wife Kari Beaty Arnoult; the Rev. Blake Arnoult and wife Ryan Plank Arnoult; Matthew Arnoult and wife Daisy Gonzales Arnoult; and great grandchildren Ella Fox, Jackson Arnoult, Colby Beserra, Paden Arnoult, Addison Arnoult, Frances Beserra, William Fox, Jr., Mazie Arnoult, Annie Blake Fox, and JT Arnoult, III. The Arnoult family would like to thank all of the wonderful caregivers and staff at The Hallmark who treated Anne with much tenderness, love and patience. We will be forever grateful. A memorial service and reception to celebrate Anne Jenkins Arnoult’s life will be held on Monday, March 25, 10:00 am, at Bradshaw-Carter Funeral Home, 1734 W Alabama, Houston. Interment will be at Forest Lawn Cemetery in Beaumont, TX, at 2:00 pm that afternoon. In lieu of flowers, contributions in Anne’s memory can be made to The Alzheimer’s Association or a charity of your choice.